Blessed with electric pace, killer goal scoring instincts and fantastic dribbling ability, George Best was one of the most naturally gifted football players of all time. Along with Bobby Charlton and Denis Law, Best formed the Holy Trinity of Manchester United, a trio that would lead the club to their first European Cup trophy. It was widely accepted that Best's hedonistic lifestyle stopped him from fulfilling his full potential, with numerous alcoholism problems in particular taking a large toll on his health and stamina. He was voted the European Footballer of the Year in 1968 and the 16th greatest player of the century in the 1999 IFFHS election. He was especially respected among his peers, with Pelé being quoted once as saying Best was the best footballer in the world. 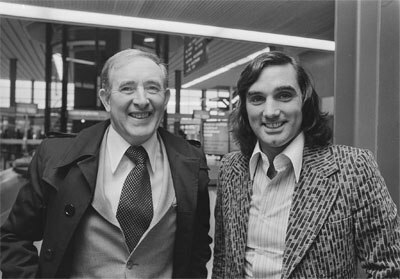 George Best (to the right) and Danny Blanchflower in 1976. With George Best's talent being obvious from an early age, it didn't take too long for him to get noticed. When Best was 15, a United scout Bob Bishop sent a now-legendary telegram to the club's manager, Matt Busby; the message read simply: "I think I've found you a genius." Best signed with the club in 1961, spending two years in the youth squads before making his first team debut in 1963, at the age of 17. By 1965, he became an integral part of the first team, helping United clinch the First Division title over Leeds. During these early years, opposing defenders often played rough in order to stifle Best's highly technical playing style; in order to prevent that from happening, Matt Busby would organize fierce training sessions that helped Best prepare for their challenges. In 1966, George Best entered super-stardom by scoring a brace in the European Cup quarter-final against Benfica; the Portuguese media were so entranced with his powerful display that they gave him a nickname "El Beatle". The following year, Best and the rest of the Holy Trinity led United to another First Division title. In 1968, United defeated Benfica in the European Cup final and became the first English club to win the competition, only a decade after the demise of the Busby Babes. As the focal point of that United team, Best was awarded the Ballon d'Or for European footballer of the Year, at only the age of 22. Against Northampton Town, 7 February 1970, George Best managed to repeat what Harold Halse had achieved against Swindon Town 59 years earlier: making six goals in one game for the Manchester team. By this point in his career, Best was far from the shy teenager he used to be when he first arrived at the club. 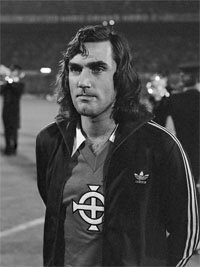 With his long hair, impeccable style and pop star looks, Best became one of the first celebrity footballers in the world and a prime target for the British tabloids. His extravagant lifestyle, filled with late-night partying and excessive drinking, slowly took over his life and football career. During his next six seasons at United, the club entered a huge downward spiral, failing to win a single trophy due to the their new recruits not being up to scratch. With his love for football slowly diminishing, Best left United in 1974, having scored 179 goals from 470 appearances in all competitions. Following his departure from United, Best went on to play in various smaller clubs from Scotland, Australia, the United States, Ireland and South Africa over the next decade, never staying at the same place for more than two seasons. Many of these short spells were fraught with incidents; for example, while Best was playing for Hibernian, he was caught in a tremendous drinking session with the entire French rugby team. He retired from football in 1983, a full twenty years after he started his professional career at United. On the international stage, he played 37 matches and scored nine goals for Northern Ireland. To this day, he is still considered by many to be the greatest Northern Irish player to ever play the game of football. With his health continuing to deteriorate due to alcoholism-related issues, even after the ending of his football career, Best continued to cause controversy everywhere he went. He passed away in 2005 due to multiple organ failure, at the age of 59. From an outsider's perspective, Best's career might seem like a warning story about the dangers of alcoholism; however, it's debatable whether Best himself would have had it any other way. As he once famously said, "I spent a lot of money on booze, birds and fast cars – the rest I just squandered".